Is it a beginning or an ending? then we wouldn't have things that would begin. We would not have hate. from the morning sunrise, to the day itself. there is a waiting game. or is it the beginning of end? I wouldn't have found you. and miles and miles of land keep us apart. The deepest wounds of loneliness surround my heart. as if you are a part of me. I have to wait to see if this is our beginning or if it's the end. I have to hold on, because I don't know what will happen next. Thank you to those of you have stopped by my blog this past month! I greatly appreciated being able to see other amazing writing pieces! 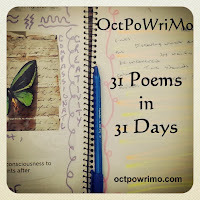 I hope you will continue to follow my blog even though it's the end of OctPoWriMo! A fabulous month indeed! I love this, how you set it up with the existential and then put us in your longing. Thank you. then we wouldn't have things that would begin." So true. And what is difficult or even horrible leads us to something wonderful. Hard to realize when the bad stuff is happening.